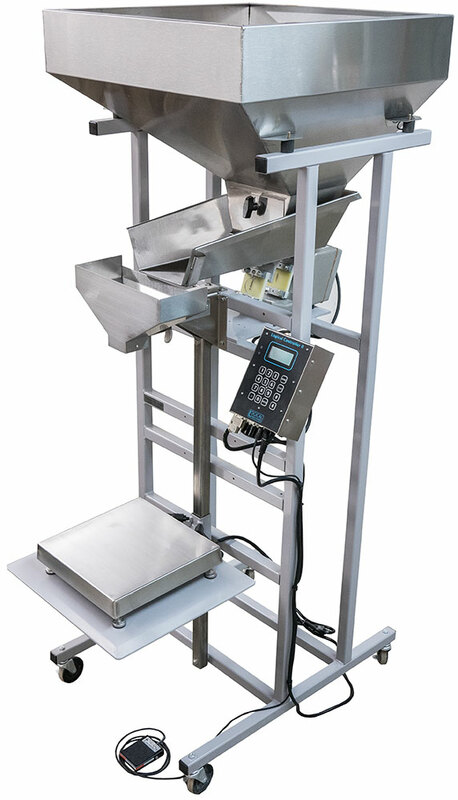 The very accurate and easy to operate Model S-5 semi-automatic scale has automatic tare, automatic feed and speed controls for both bulk and dribble feed rates, and automatic set points. 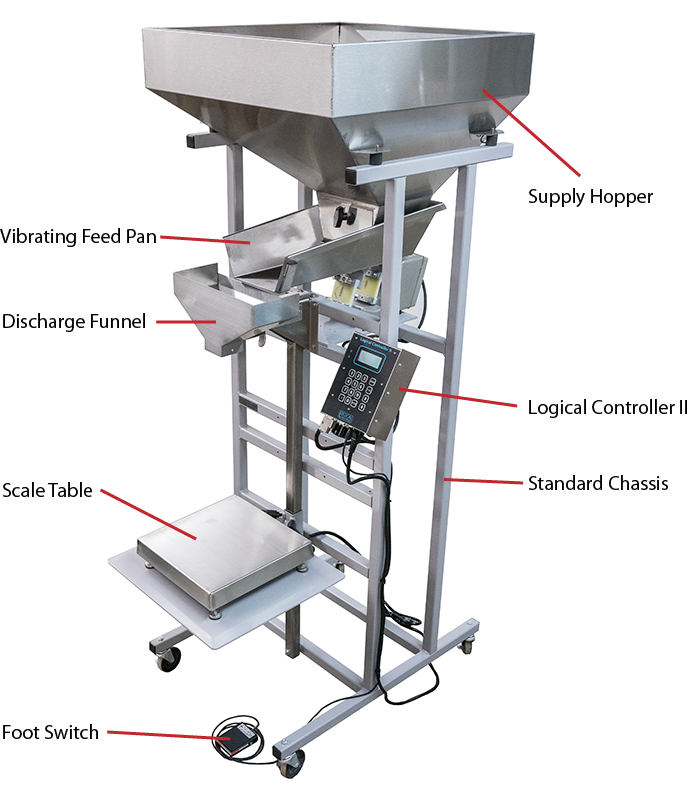 The product flow from the hopper to the feed pan can also be controlled by an adjustable slide gate. Example: To run a relatively free-flowing product into a 10lb. package, the product is loaded into the Supply Hopper, and the target weight is set at 10lb. The package is placed on top of the scale, and the table is adjusted (up/down) so that the funnel is inside the bag in order to keep the bag "standing" when empty. After starting the first fill cycle with the foot pedal, the controller will automatically switch into "learn mode" for the first cycle. During this time the controller tests the flow characteristics of the product and decides the best speeds and durations for bulk and dribble.The controller will automatically change the vibratory feed from bulk to dribble and stop the scale at 10lb.The bag is removed and sealed. Each successive container is now filled by placing it under the funnel and depressing the foot pedal. All product contact surfaces are stainless steel and easily disassembled for dry wiped-down and cleaning. Table Size: 16" wide x 18" deep. Table height adjustable to accommodate containers from 3" to 36" high. $5,450.00 Standard S-5, F.O.B. Charlotte, VT 05445 — Get an instant online quote using our Quote Generator! The S-5 is typically kept in stock for quick delivery.